Movies like iRobot paint a very grim picture of the future. Machines and computers become very powerful and are able to replicate themselves, thereby replacing humans. Is this really going to happen, and if so, is it going to be as dramatic as that? It is true that the computer is becoming increasingly powerful and has a huge impact on our lives. Yet, is this necessarily bad? On the one hand, this technology brings a lot of benefits and we feel like we are no longer able to live without computers. On the other hand, they pose a threat, because they make it possible to automate a lot of our jobs. Do we need to worry? We have always used machines to eliminate or improve routine tasks. Just think of the watermill that helped us to grind flower instead of having to do this by hand, or the washing machine that stopped us from having to wash or launder manually. The impact of these two machines seems rather small, but it did have an impact on someone’s job. Larger events such as the industrial revolution did have bigger consequences for employment and this did not always receive a warm welcome. In the sixteenth century, the queen of England refused to grant the patent for the automatic knitting machine to William Lee stating that “it would assuredly bring to them ruin by depriving them of employment, thus making them beggars. During the industrial revolution, the Luddites destroyed machines because they were seen as a threat. As always, humans don’t like change, especially when it’s very disruptive. However, we should look at it from a positive angle. What was clear from the examples above is that skilled artisans were replaced by machines that could be operated by lower skilled workers, who were supervised by higher skilled workers. That means that the greatest beneficiaries of the industrial revolution actually were the unskilled workers. As the machines became more and more complex, this balance did shift in the twentieth century in that more knowledge was needed to operate a machine. This favoured the higher skilled workers again. Furthermore, it also led to a race between technology and education. In order to stay competitive as an employee, you needed to stay abreast of the latest technology. Even if computers were to replace us, it will also mean a shift in the types of jobs we do. The obvious question is to ask whether there will still be something to do. Machines and computers have traditionally replaced routine cognitive and manual tasks. However, the non-routine tasks are gradually being handled by computers as well. An example of a computer performing a complicated non-routine cognitive task is IBM’s Watson. It is able to diagnose cancer using the data from medical journal articles, medical evidence, patient records and clinical research data. 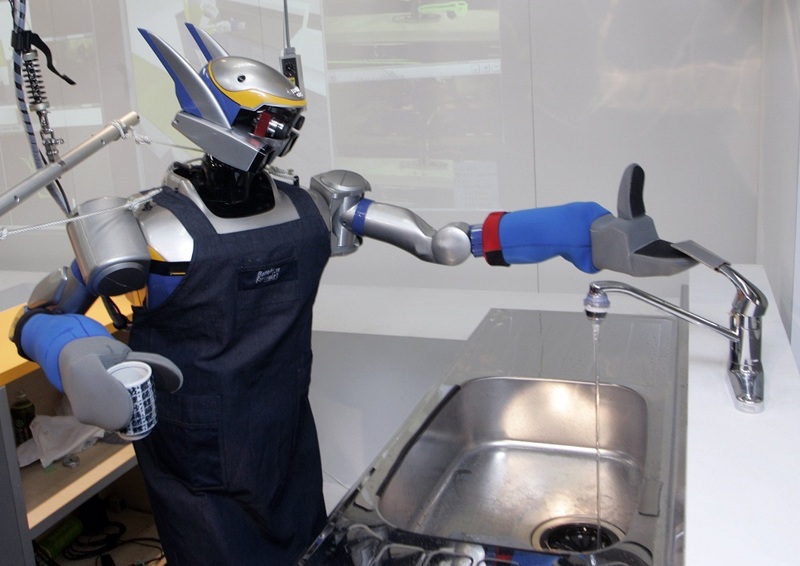 The evolution of sensor technology has also allowed robots to perform non-routine manual tasks. Machines are able to learn as they operate. Typical examples are household robots. The big question is how far this will evolve and whether robots will eventually become self-aware. Recently, a robot passed a simple self-awareness test. It is an indication that the race is on, but there is still a lot of room for us to stay ahead of this evolution. A key element is that the cost of computation time has gone down dramatically and will continue to decrease. Computers have also reduced in size and more computational power can now be built into smaller machines and robots. How will this impact future employment? Carl Benedikt Frey and Michael A. Osborne at the Oxford University Engineering Sciences Department came up with a mathematical way of estimating which jobs were under threat. They realised that jobs that had more accurate task descriptions could be more easily computerised. Tasks which are more difficult to describe lead to a computerisation bottleneck. They estimate that these bottlenecks will shift as technologies evolve. However, they can give a good indication as to which jobs are closer to the bottleneck and also those which are further away. The following bottlenecks were identified: perception and manipulation, creative intelligence and social intelligence. They ranked about seven hundred job types. The big picture conclusion is that jobs which require creativity and social skills were less at risk than jobs requiring manual dexterity (perception and manipulation). What also became clear is that highly paid and highly skilled jobs are less sensitive to computerisation. Contrary to the industrial revolution, the lower skilled worker is becoming vulnerable. Driverless cars will have a huge impact on the transportation sector. The legal sector will see the growing effect of computers doing more effective research and even allowing more effective decision making processes excluding human bias. Of course, this is just a mathematical prediction but it does highlight some interesting points. What makes us specifically human will drive where we will still have jobs and that is very positive. According to the predictions, about half of the jobs in the U.S. are at risk because of computerisation. This might seem to be a lot, but it is not dramatic. What needs to happen is that workers who are at risk are moved to professions that are not at risk and new skills will need to be learned. This was also the case in the past and only now has the pace increased. At the same time, the available knowledge has increased due to the development of the Internet. This is a great example of how computerisation can help humans to learn faster and stay ahead of the technology race. Governments have a big role to play. On the one hand, they can control the pace at which technology gets deployed, such as setting the legal framework for driverless cars. On the other hand, they can ensure the reorientation of the workforce by identifying risks, creating conditions for new jobs and providing education. During the industrial revolution, the UK government realised that the technological advances could not be stopped and they did have great benefits. This made them pass a law making the destruction of machinery punishable by death. The above study only took the jobs that exist now into account. New jobs will emerge through all the technological changes. Examples are drone controllers or space miners. The key take-away is that you have to keep an open mind and need to be willing to keep learning. It is important to keep seeing the opportunities. It is also important to notice that machines will actually drive us to be more human. We can start focusing on what makes us unique as humans. For instance, in hospitals, the routine tasks, e.g. cleaning, can be performed by robots, yet the real human tasks, such as a friendly conversation with a patient, will become the ultimate job of a human. However, with the advancements of social intelligence and social mimicking, even that could be technically covered, although the chances are high that people won’t like it, at least not for now.